ONE of the most attractive buildings in the east end of Helensburgh is the Victoria Infirmary, built in 1895. The work of one of the town’s leading architects, William Leiper, the former cottage hospital looks in fine condition from the outside, but inside only the ground floor is in use as part of today’s Victoria Integrated Health Care Centre. 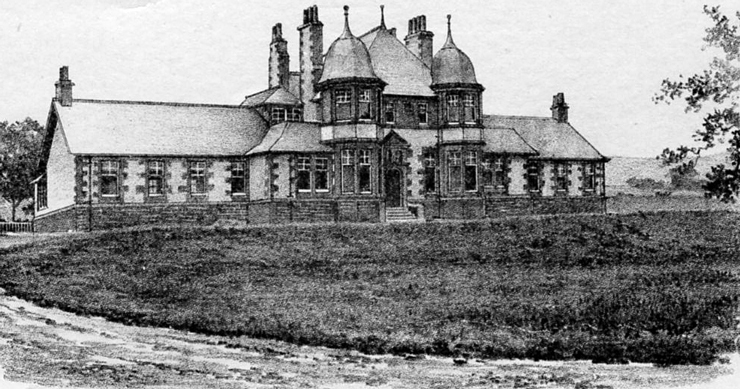 The original Helensburgh Hospital was opened in 1876, and Anne Alexander, of Lomond Cottage, Lomond Street, was the principal donor of funds to build it. She left the residue of her estate, £946, for that purpose, and a large glass door panel commemorating this can be seen in the town medical centre in the Dr Macleod and Partners area. Originally the hospital was intended for the treatment of infectious and non-infectious diseases, but as this arrangement soon became impractical it was decided to build a new hospital for non-infectious cases. A new site was chosen between King Street and Granville Street, adjacent to the existing hospital, with the ground being secured from the Colquhoun Estate trustees. 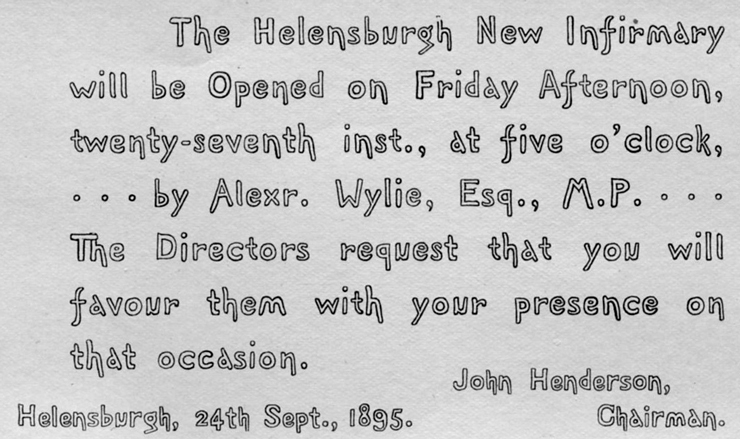 The new red sandstone building was officially opened on September 24 1895, and named the Helensburgh New Infirmary — its neighbour becoming the Infectious Diseases Hospital. Two years later, in Jubilee Year, the new building’s name was changed to the Victoria Infirmary. In its heyday the top storey had the private rooms, while downstairs were the public wards, operating theatre, matron’s office, and consulting rooms for doctors. In the main hall to this day are elegant light oak plaques bearing the names of donors over the years, and some bronze plaques naming donors of endowments for particular beds which have been moved there. But there is no mention of the many local workers who had money deducted from their wages every week on a voluntary basis to put towards the running costs. Four doctors took it in turn to attend the hospital and two directors visited the infirmary in rotation to see that efficiency and economy were duly attended to. The bed complement downstairs of 22 was divided evenly between 11 males and 11 females contained within the two wings of the hospital, mostly general medical and surgical cases. Helensburgh man Colin Lawrie, a well known local piper, donated to Helensburgh Heritage Trust the sketch and invitation reproduced here. At the time of the opening in 1895 the matron was Miss Keillor, and the hon treasurer for the building fund and vice-chairman of the directors was banker Adrian Kidston, later to serve as Provost from 1911 until his sudden death in October 1912. An obituary for Provost Kidston stated that the town owed in large measure the building and equipping of the Infirmary to his wonderful gift of raising money. The chairman of the directors was John Henderson of Towerville, and the other directors were ex-Provost Mitchell, ex-Bailie Graham, Dr Ewing Hunter and Dr W.R.Sewell, both local GPs, Major F.G.Gemmill of Rhu Arden, Colonel T.A.Paul of Dunarden, D.H.Anderson of Clarendon, James Allan of Woodend, and J.B.Mackay of Glenelg. One of the jobs which would have kept Mr Kidston busy was control of the costs, and a collection of hospital estimates from local tradesman found by Colin Lawrie is fascinating reading. James Dickson of Clyde Street offers to supply for one year from October 1 1880 best oatmeal at 1 shilling 10 pence per stone, Rangoon rice at 2s per stone, good black tea at 2s 6d per lb, cheese (Cheddar and Dunlop) at 10d per lb, and best quality hard soap at £1 10s per hundredweight. L.J.M.Campbell, Chemist, offered for the same year cod liver oil at 1s per bottle, laudanum (tincture of opium) at 4s per lb, sulphate of magnesia at 2d per lb, quinine at 12s per oz, and steel drops at 3d per oz. John Simpson of Drumfork Farm offered warm milk at 11d per 2 pints and skim milk at 5d per pint, with fresh butter at 1s 7p per lb, while Gilbert Gillies, Coal Merchant, delivered coal to the cellar at 10s 9d per ton. Meanwhile Hamilton MacMillan of West Princes Street offered to supply — whether to staff or patients is not clear — malt whisky at 2s 6d per bottle, gin at 2s 8d per bottle, good brandy at 4s per bottle, London Porter or beer at 2s 4d per dozen pints, and champagne at 6s per bottle and 3s per half-bottle. The rules for purchases were that in the event of any of the goods being inferior or defective in quality, the committee reserved power for the matron to refuse them. The committee also did not pledge themselves to accept the lowest tender. The hospital was maintained by voluntary subscription until 1948 when, at the inception of the National Health Service, administrative control was transferred to the Western Regional Hospital Board. In 1951 a new physiotherapy, X-ray and out-patients unit was opened. Following the reorganisation of the NHS in 1974, control of the hospital transferred to the Dumbarton District of the Argyll & Clyde Health Board. That Health Board was dissolved in 2005, and responsibility for the building passed to NHS Greater Glasgow.